"Once in a while, a book comes along that summarizes most of what's important about a particular subject, and does so in a way that's lucid and effortless. One such book is Jarrett Walker's Human Transit." Better Cities & Towns, a Congress for the New Urbanism magazine. PDF. Or here it is online. I specifically like Bill's praise for the earliest CNU conferences, where everything happened in plenary and as a result, people had to listen to things they might not want to hear. I have read your book. 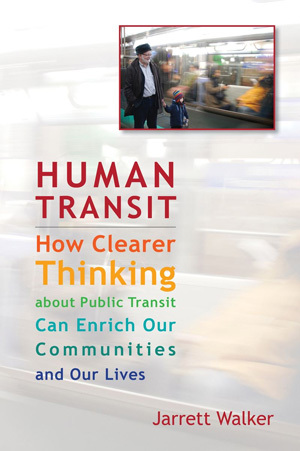 It should be mandatory reading for anyone who wants to go into transportation or transit planning in university. I did undergraduate work in electrical engineering and graduate work in civil/transportation planning. Your book could replace what I learned in about 4 courses for a hell of a lot less money. What you said is so obvious that it is amazing it needs to be said, but it does. It is the best investment I have ever made in a book. Now if you could only write a book about the horrible illumination that occurs in most cities as a result of “EFFICIENCY.” I took a course on illumination theory for streets and urban area and they were pushing the wonders of first mercury vapour lighting then high pressure sodium vapour. These were the worst forms of illumination ever inflicted on humanity. They are so monochromatic as to render a street to be totally inhospitable to humans. The old city of Toronto was probably the last one in North America to use incandescent lighting. I remember being told in class that this was so inefficient with light levels too low for safety. I bought these arguments but could not help but think that the streets were so much more inviting than the suburban streets with there blue or orange lighting. Toronto is now trying to use white lighting from metal halide luminaires but there is still to much orange lighting in the suburbs. Engineers need to look at other things besides “EFFICIENCY.” I bought into these arguments before I finally saw the “LIGHT.” I would be interested in your opinion on street lighting and how it effects the humanity and livability of the urban environment.